Captions: (bottom left) Mortars fired shells at a high angle so they would fall on decks, penetrate and explode inside targeted ships. (top center) Battery Alexander's mortars weighed 59 tons and had a range of 8 1/2 miles. The concussion they produced was so powerful that unprepared crew members could be knocked off their feet. The soldier at the right had just pulled a lanyard to fire the mortar. (bottom center) Floor plan of Battery Alexander; In rooms at the far end of the battery, switchboard and plotting crews worked closely together. The switchboard operators received data from the lookout posts located in key spots north and south of the battery - information about the enemy's location, rate of travel, and course. The plotting crews used the data to aim the mortars. 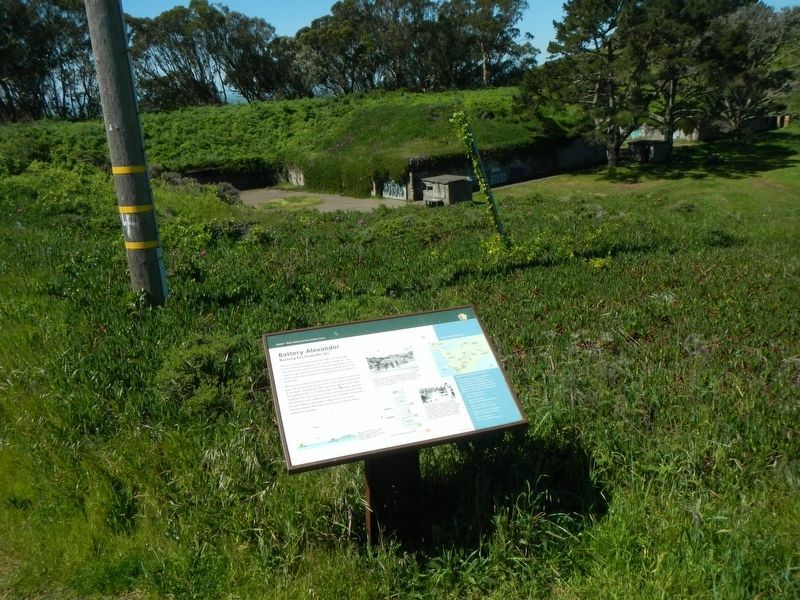 ; (right) Map of historic gun batteries near here. 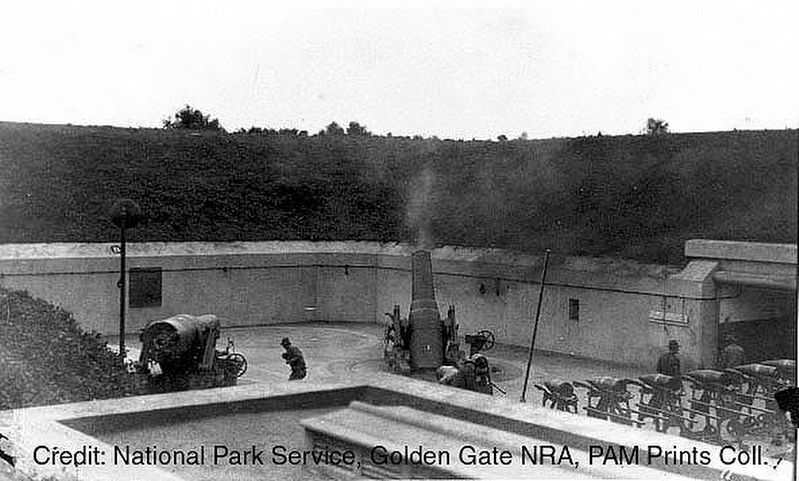 Strategically designed to contribute a combination of firepower to San Francisco's harbor defensed, Fort Barry's Endicott Period (1885-1903) batteries were mounted with mortars, big guns, and smaller rapid-fire guns: Battery Alexander - eight 12-inch mortars, Battery Mendell - two 12-inch disappearing guns, Battery Smith-Guthrie - four 6-inch rapid-fire guns, Battery Rathbone-McIndoe - four 6-inch rapid-fire guns, Battery O'Rorke - four 3-inch rapid-fire guns. Battery Alexander, fully armed by 1906, mounted eight 12-inch mortars designed to fire shells in a high arc - up and then down onto the decks of enemy battleships. Low-trajectory gunfire from nearby batteries, aimed close to the enemy's waterline, would have joined Battery Alexander's mortar fire. Because it was believed that mortars were less accurate than guns, all the mortars in a pit, or an entire battery, would fire at an enemy battleship at the same time. 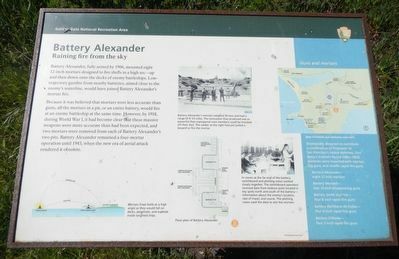 However, by 1918, during World War I, it had become clear that these massive weapons were more accurate than had been expected, and two mortars were removed from each of Battery Alexander's two pits. Battery Alexander remained a four-mortar operation until 1943, when the new era of aerial attack rendered it obsolete.
. Touch for map. Marker is at or near this postal address: 960 Field Road, Sausalito CA 94965, United States of America. Touch for directions. Other nearby markers. At least 8 other markers are within 3 miles of this marker, measured as the crow flies. Nike Missile Site SF88 (a few steps from this marker); Mortars to Missiles (approx. 0.2 miles away); Battery Mendell (approx. 0.3 miles away); Cold War Legacy: Missiles to Marine Mammals (approx. 0.6 miles away); Battery Construction No. 129 (approx. 1.6 miles away); The Golden Gate (approx. 1.6 miles away); Construction 129 (approx. 1.6 miles away); Strengthening an Icon (approx. 2.6 miles away). Touch for a list and map of all markers in Sausalito. More. Search the internet for Battery Alexander. Credits. This page was last revised on April 15, 2017. This page originally submitted on April 15, 2017, by Barry Swackhamer of San Jose, California. This page has been viewed 192 times since then and 4 times this year. Photos: 1, 2, 3. submitted on April 15, 2017, by Barry Swackhamer of San Jose, California.